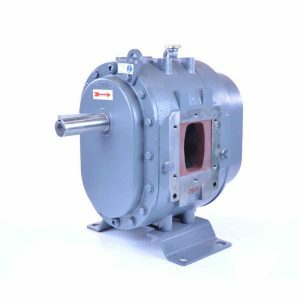 ROOTS-FLO® Positive Displacement Blowers | pdblowers, Inc.
ROOTS-FLO® Positive Displacement Blowers are available in 4 different models. Units are designed to be drop-in replacements for the DuroFlow® 45 series blowers and Big Jack Inc A4 series. ROOTS-FLO units are engineered for pneumatic conveying of grain and similar products. Unit is available in 4 different models. 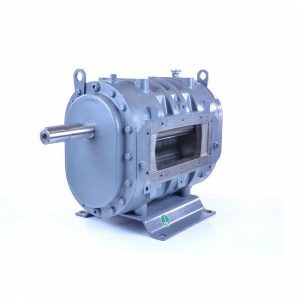 Units are designed to be drop-in replacements for the DuroFlow® 45 series blowers and Big Jack Inc. A4 series. Piston ring seals reduce leakage through the shaft openings in the headplates. Lip type seals prevent lubrication from entering the air chamber. 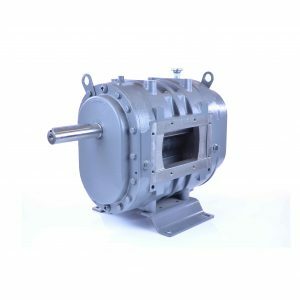 The basic model features a ribbed cast iron casing and ridged headplates, carburized and ground alloy steel spur timing gears secured to steel shafts with a taper mounting and locknut, and cast iron involute impellers. Oversized anti-friction bearings are used, with a cylindrical roller bearing at thedrive shaft to withstand V-belt pull. 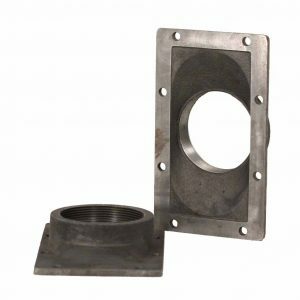 Detachable rugged steel mounting feet permit easy in-field adaptability to either veritcal or horizontal installation requirements. Machined and dynamically balanced ductile iron impellers with integral shafts per ASTM 536 Class 60-45-12 and 80-60-3 for additional strength on maximum load operations. Impellers are computer designed for maximum efficiency. At maximum load and speed our extra capacity cylindrical roller drive shaft bearing has 2.5 to 3 times longer bearing life than the competitive units ball bearing. 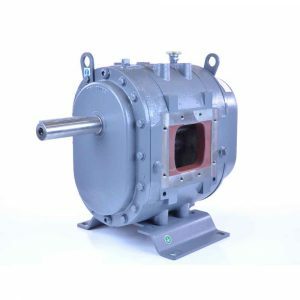 Gears are spur type SAE 8620 steel carburized and ground to 58-62RC for tough continuous operation, without inducing harmful thrust loads. Gears are reliably mounted with a taper fit to the shaft. Main air seals are piston ring for minimal leakage. Bearing and drive shaft oil seals are Viton lip. All are proven ROOTS design and rated for severe duty.